Slender and majestic, the Castle of Serralunga d'Alba overshadows one of the most beautiful and historically intact villages of the Langhe, surrounded by the hills of Barolo vineyards. 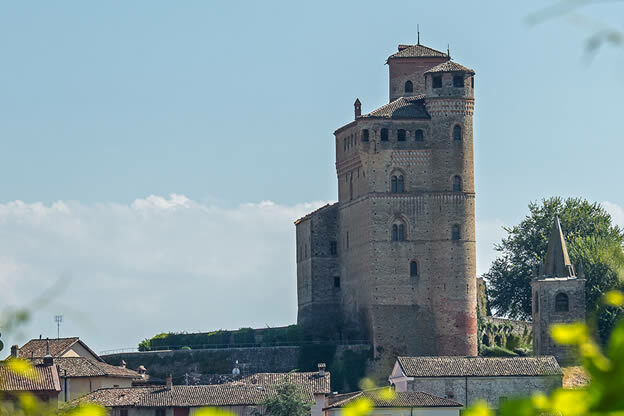 Considered to be one of the best-conserved examples of 14th century noble castles in Piedmont, this castle represents a unique piece of history in Italy with an architecutral structure of a French donjon. The castle's construction was carried out between 1340 – the year in which the Falletti family received its estate as recompense for military involvement – and 1357. This information is gleaned from documents that register a sale carried out in one of the castle rooms. The fact that it was never the object of military importance nor was it structurally transformed over the centuries have kept this castle unaltered. Its Medieval fortress is, in fact, the original structure. Instead of military use, this castle was used throughout the centuries as a point of control over the production activities in the territory, as evidenced by its imposing, vertical stance that was intended to emphasize the prestige of the Falletti family. Already at the end of the 1300s, the castle was complete with its palacium, the long and compact principle building, and large rooms superimposed upon one another for delegation duties and living space. Its large cylindrical tower was also already constructed, as was the rooftop that affords an incredible view today, but was overall a status symbol at the time. The courtyard at its quadrangular base is characterized by a drawbridge. The ample area of the palacium at the courtyard level was the seat of public affairs where the lord of the castle administrated justice. The room is characterized with its wooden roof and the small votive chapel with frescoes from the 15th century. The upper room was for living, and has three chimneys and even a latrine carved into a special space in the wall, a relative comfort for the day. On the third floor is a hidden parapet, initially open and protected by merlons, today covered with a roof. From the windows of the third floor, visitors can admire the spectacular view of the Langhe from its vineyard-covered hills to the snow-topped Alps, a panoramic scene that is especially breathtaking on clear days. The castle has been the property of the State since 1949 by its purchase by the Opera Pia Barolo, the institution created by Juliette Colbert, the wife of Carlo Tancredi and the last Marchesa of the Falletti family of Barolo (better known as Giulia). Between the end of the 1800s and the beginning of the 1900s, it seems that the care of the castle on the part of Opera Pia was of less concern than the castle's more productive use: for many years, the rooms of the castle were used as storage for agricultural products. Immediately after World War II the castle was purchased by the State, and remains its property today under the Superintendence for Architectural and Landscape Heritage in Piedmont. Today, Barolo & Castles Foundation manages the castle, awarded as a group with the Committe for the Valorization of the Castles of the Langhe and Roero by the announcement issued by the Regional Directive for the Cultural and Landscape Heritage of Piedmont.